Parker Theory’s infectious melodies have attracted widespread attention and enthusiastic local radio play since its inception in 2000. 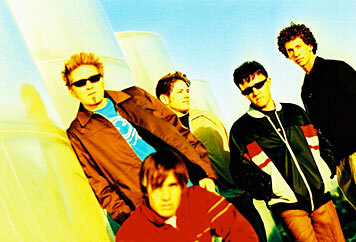 The first recording, a self-titled EP, impressed Steven Harwell, the lead singer of Smash Mouth and opened the door for the band to begin playing some of the popular venues in California with the novelty rock band. The first track off the band’s debut album, Can Anybody Hear Me, was the top pick in a University of Columbia research project featured in the National Geographic news where 14,000 participants chose their favorite song without knowing who the band was. The same song, "She Said," topped mp3.com’s pop rock chart and led to Fabtone Records releasing an extended version of the album in Japan . Can Anybody Hear Me was also nominated in the Orange County music awards, and the San Diego music awards alongside some of the biggest names in the San Diego music scene—Switchfoot, Unwritten Law, Jason Mraz, and Slightly Stoopid. The following year Pruett decided to write a new album at home on acoustic guitar. “I wanted to try and just write what was coming out naturally and what I was feeling or thinking about at the time and focus on the basics,” he says. After months of writing, he got back together with Forrest and his bass player Jon Upson, and asked his friends—drummer Jarrod Alexander, and guitarists Nick Maybury of Future of Forestry and Rob Fikse—to play on the album. The album was produced by Pruett and recorded at Doubletime Studio with Forrest (Blink 182, As I Lay Dying, Incubus). The stories, experiences, and passions on Leaving California share the universal laughter, sadness, joy, and hope of the adventure of life. Pruett wrote the album at home on acoustic guitar in 2006. “I wanted to try and write what was coming out naturally and what I was feeling or thinking about at the time, and focus on the basics,” he says. In early 2008 Pruett took a break to write and record and released "One Purpose, One Destination" and "Stop Freeze Time". With lots of emotion and energy this San Diego band leaves you feeling good and wanting more. Over the years they have played with many national acts and amazing venues.